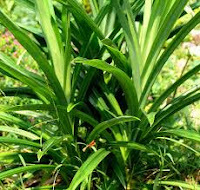 Pandan leaves or Latin language it is pandanus amaryllifolius Roxb. This is an annual herbaceous plant with a height of 1-2 meters. Usually there are many and growing in damp areas such as along the rivers or swamps and often also planted in the yard. Single leaf shape and long and green with a pointed end. While the round-shaped stem with leaf spotting holder, branched, and spread. Perhaps this plant certainly is not foreign to our ears. Because leaf pandanus not uncommon in use in our daily life. Moreover, the eve of the holy month use is selling well used to mix iftar dishes such as compote, a mixture of sugar, cooking the rice, cook mixture kolang forth, and much more. This in because of pandan leaves can give fragrance and gives a natural green color on the food. Benefits Pandan leaves can also be used to increase appetite, reduce cholesterol, boost immunity, prevent coronary heart menyakit, as antidioksidan and besifat antibiotics. Content of Substance In Pandan Leaf, among others, such as linoleic acid, phytosterol, stearic acid, tannins, alkaloids, saponins, polyphenols, flavonoids, steroids, terpenoids, and dyestuffs. Pandan leaves into small pieces and then boiled with water. Wait until the remaining water to cook and only stayed about 2 cups. 2 times a day morning and evening 1 cup per a drink. Coconut oil dipanas accomplished while in stir. Then pour pandan leaf with coconut oil which has been heated earlier in the mix again until smooth. Rub into the sick body. Rinse and cut the material leaves and flowers. Then enter into a pot that has been given sesame oil, coconut oil, and hazelnut oil. Heat until cooked. Once cooked strain and chill. Apply to entire scalp while in massage at bedtime. The next day a new shampoo. Performed regularly 2-3 times a week.